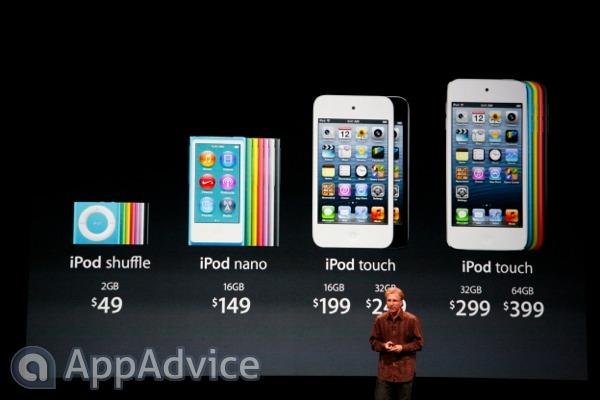 Apple has just announced the upgraded and redesigned iPod touch at its media event in San Francisco. And the device has taken a big leap forward. The fifth-generation device will be sporting the dual-core A5 chip and the same 4-inch screen as the iPhone 5. Graphics will run up to seven times faster than the previous-generation iPod touch. Battery life is also improved with 40 hours of music playback and 8 hours of video playback. For the first time, it will come in five colors - silver, black, blue, yellow, and red. And the camera is vastly upgraded as well with a 5 megapixel sensor. It is backside illuminated, f/2.4, 5-element lens, and comes with the same sapphire crystal lens color as the iPhone 5. It will also have the same Panorama feature. The front-facing camera will also be upgraded to 720p FaceTime HD. On the video side, users will be able to shoot 1080p video with image stabilization. Probably the most surprising is that Siri making its way to the iPod touch. Also, the touch will have a built-in, color-coordinated loop to help secure it around your hand. 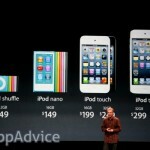 The new iPod touch will be available in October and start at $299 for a 32GB version and $399 for the 64GB edition. The previous-generation touch will also stick around and be priced at $199 for the 16GB edition and $249 for the 32GB version.